As a young man, Andy Griffith studied for the ministry, then got a degree in music and taught high school for several years. During this time he worked up a comedy routine including his famous bit "What It Was, Was Football", about a country boy's misunderstandings as he watched his first football game. With his comfortable southern drawl, Griffith was a natural to play PFC Stockdale, the hillbilly hick gone military in Ira Levin's play No Time for Sergeants. Griffith starred in the play in regional theater, in a live broadcast on ABC's The U.S. Steel Hour, on Broadway, and eventually in a well-received film adaptation (with Don Knotts in a supporting role). Griffith's first film was a dramatic turn that is still impressive: A Face in the Crowd, with Patricia Neal and Walter Matthau. Griffith played Lonesome Rhodes, and on the surface he was another hillbilly, but when Rhodes found fame he became a frightfully different man. On The Andy Griffith Show, Griffith played Andy Taylor, an amiable sheriff in the quiet and overwhelmingly white Southern town of Mayberry. There was little crime for the sheriff to deal with, so most episodes revolved around Andy and his son Opie (Ron Howard), his Aunt Bee (Frances Bavier), and his bumbling deputy Barney Fife (Knotts). The show ran eight seasons, and spent all that time in the top ten, and it is now considered one of the best sitcoms of all time. Most of the Mayberry settings and several of its characters were based on Griffith's real-life home town, Mt. Airy, North Carolina. In one episode, the fictional Andy mentions once having a crush on a schoolgirl named Barbara Edwards. She was Griffith's wife. 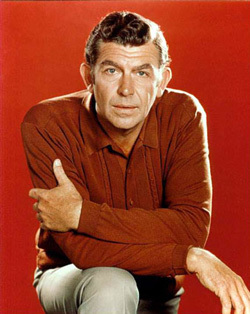 Griffith's subsequent sitcoms included The Headmaster and The New Andy Griffith Show. He played another sheriff in the quickly-canceled mystery Adams of Eagle Lake, and ran a junk yard in Salvage 1. In the late '80s through mid-1990s he played Matlock, a deceptively laid-back southern attorney. It was very popular with older audiences who loved seeing Andy outsmart all those city-slicker lawyers, while younger audiences enjoyed its unintended camp value, featuring cheesy scripts and washed-up guest stars. Hollywood Walk of Fame 6420 Hollywood Blvd.